I hope everyone had a very Merry Christmas! We sure did, I can't believe it is over! Time seriously flies. 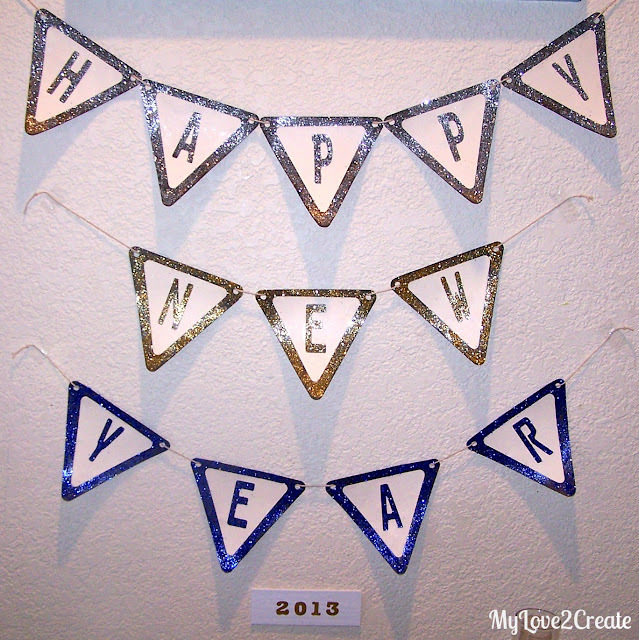 I wanted to do a simple project for New Year's and decided to do a Happy New Year banner....with glitter! It was super simple but a little messy, I haven't done much with glitter since....high school. Luckily I had a little in my stash, but not enough to do all one color. So I went with three different colors of glitter and barely had enough. 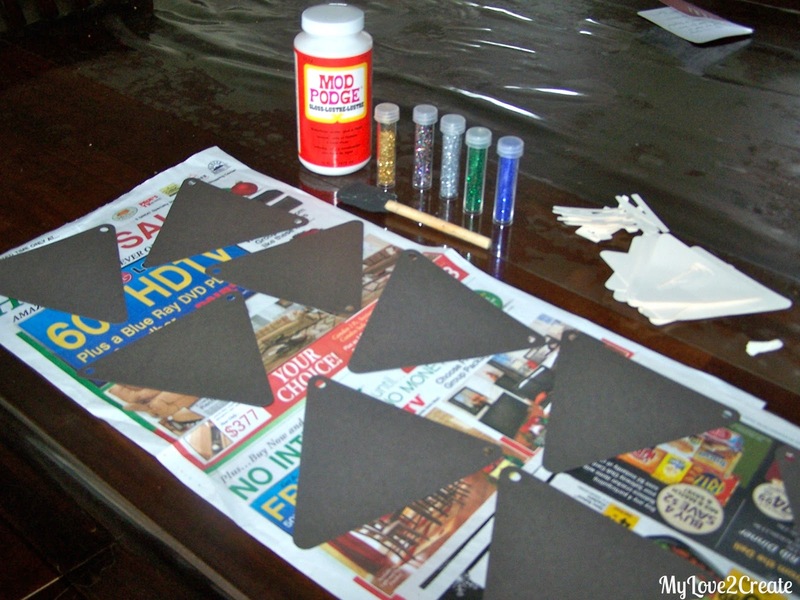 I cut out some triangles and punched holes in them for the background. I also made smaller triangles with letters in them. 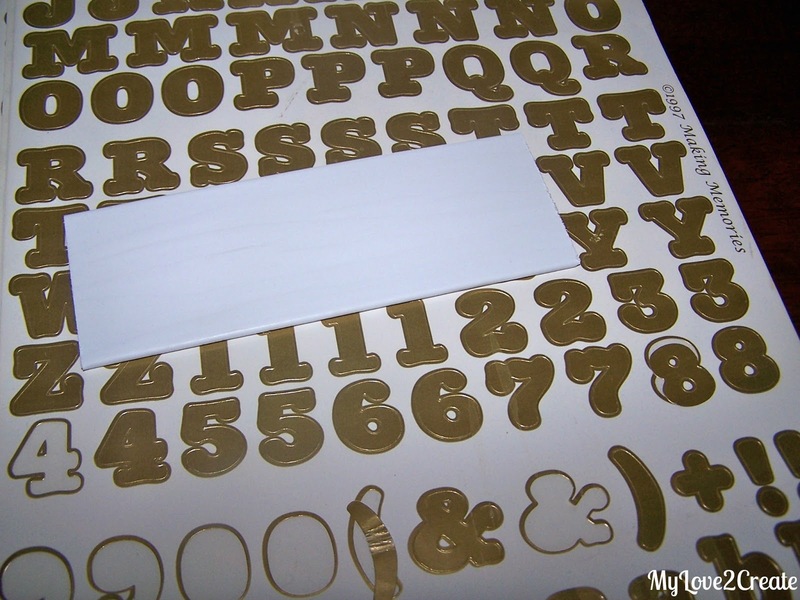 I cut these on on my cricut, but you could easily just trace the pattern and letters with a template and cut by hand. 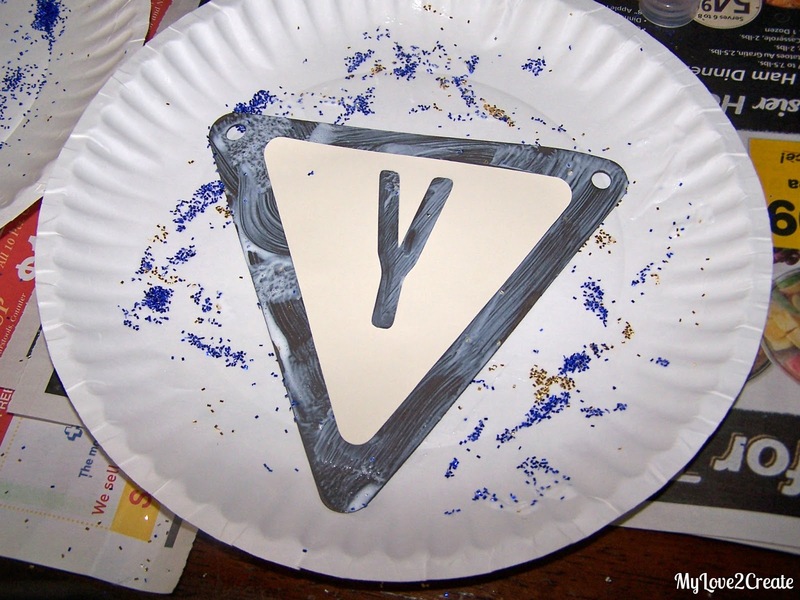 I put on a layer of mod podge. Then set on the smaller triangle with the letter cut out. I made sure to push it down really well. Next I added the glitter! Making sure it to cover all the background. And here they are drying. 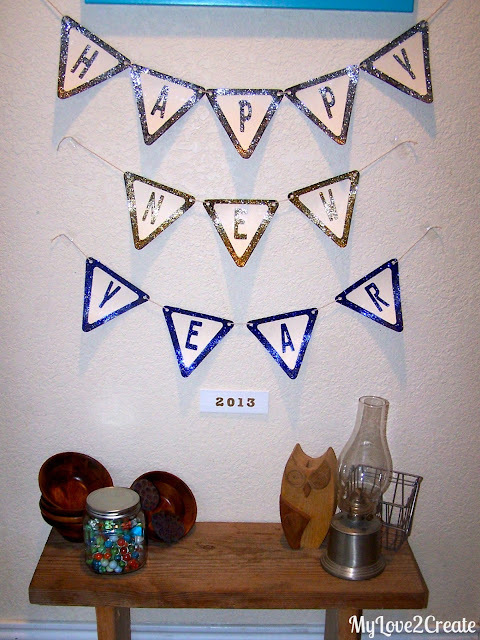 While they were drying I realized that I didn't make the year. So I grabbed a scrap piece of leftover blind (projects from these Here, and Here). Then I stuck on the year with stickers. I strung it with twine, and literally taped it on the wall. I wanted to do it on a wood board, but couldn't find one big enough, and just ran out of time. I actually think it is cute on the wall though. Sorry for the glare, I did spray the finished pieces with clear sealer, so the glitter wouldn't shed as much, and it is very overcast so I had to have a light on. 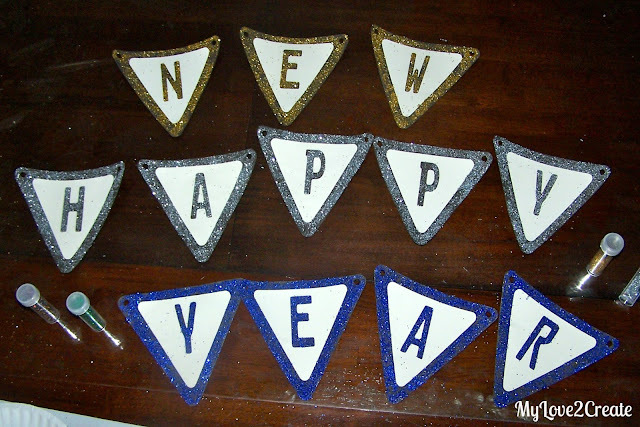 Even still it is fun to get ready to ring in the new year, I have a lot of goals to accomplish this year! I hope you have a very Happy New Year yourself! Such an adorable banner. 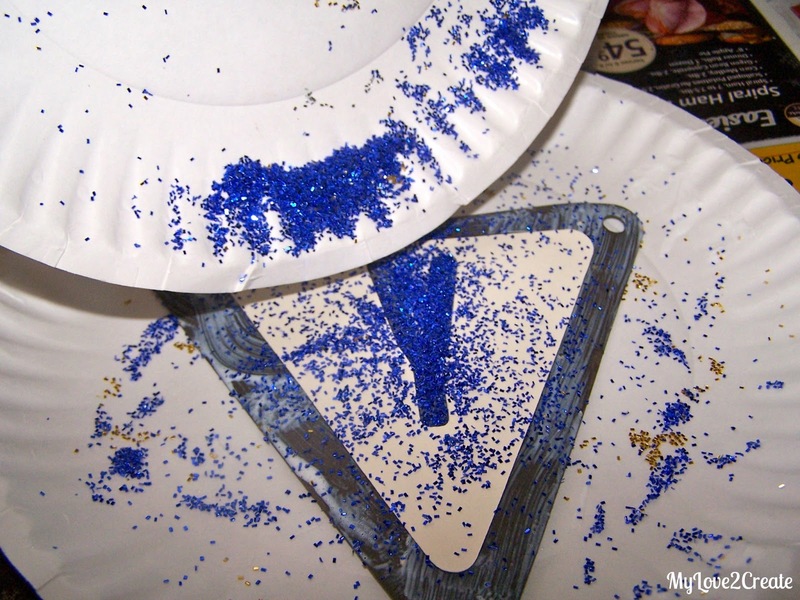 I am always afraid of glitter, but I may have to give this a try! A pretty festive project! It looks perfect on the wall above the cute bench! 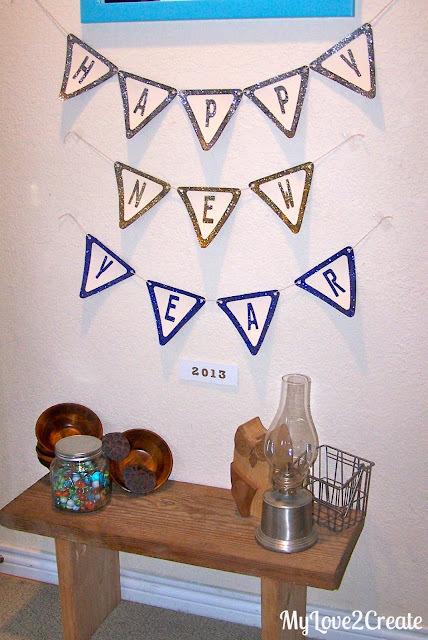 Have a great 2013, Mindi! This is a great idea. I never think to decorate for New Years! I love that you added glitter :) I'm excited to be following your cute blog! Love this idea ;) I'm a new follower! 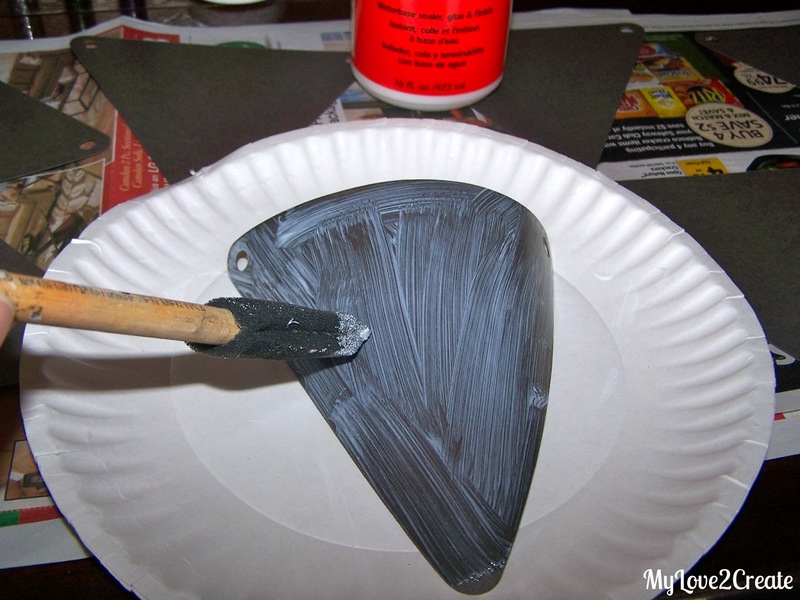 I need to start making creative projects like this.. That's my plan. Very cute! Hope you had a fun celebration! SOOO glad I found your site. 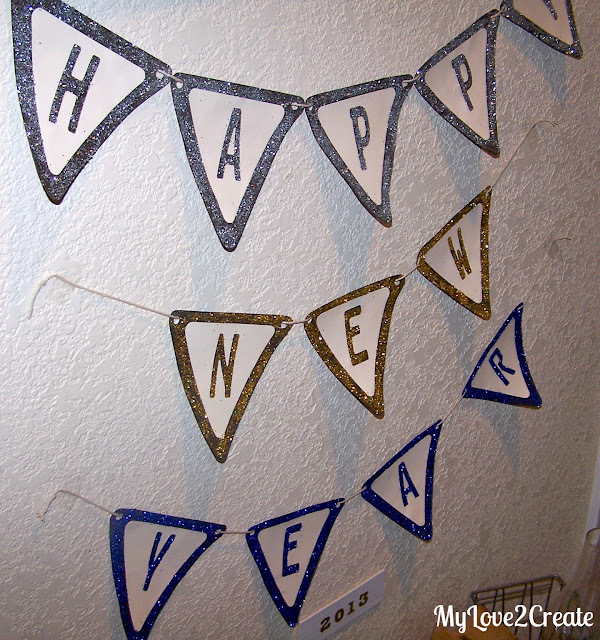 I wanted to make a banner like this for my son's 1 year birthday... and now this "non crafty" person can be crafty thanks to you!!! Love it!